The new Sony A6400 is the fourth model in Sony's range of APS-C sensor mirrorless cameras, joining the A6000, A6300 and A6500 in the lineup. It features the same 24.2 megapixel sensor as the A6300 and A6500 cameras, along with the latest BIONZ X image processor, which now enables the Alpha A6400 to record at ISO 102400. The A6400 can capture 4K HDR (HLG) 3840x2160 video at 30fps, along with Full HD 1080p content at 120fps, both without any limits on the recording length. Autofocus performance has been further improved, with the A6400 featuring 425 phase detection and 425 contrast detection AF points that cover 84% of the entire image frame. This helps ensure accurate subject tracking, and with the aid of Sony’s powerful Bionz X image processor, gives the A6400 a claimed focusing speed of just 0.02 seconds, more than twice as fast as the A6500. Furthermore, the Sony Alpha A6400 offers real-time Eye AF and real-time AF tracking with AI-based subject recognition, which is instigated by half-pressing the shutter button, rather than via a custom button as on previous models, and the AF now works in low-light down to -2EV. Sony claim that all of these improvements make the A6400 the best camera in both their APS-C and full-frame ranges in terms of AF performance. Other key new features include a 180-degree tilting monitor with touchscreen operation, an improved menu interface, built-in timelapse mode, 11fps continuous shooting with continuous AF/AE tracking with the mechanical shutter and 8fps with the silent electronic shutter, Bluetooth connectivity, 1:1 aspect ratio for JPEGs, and an improved peaking function. 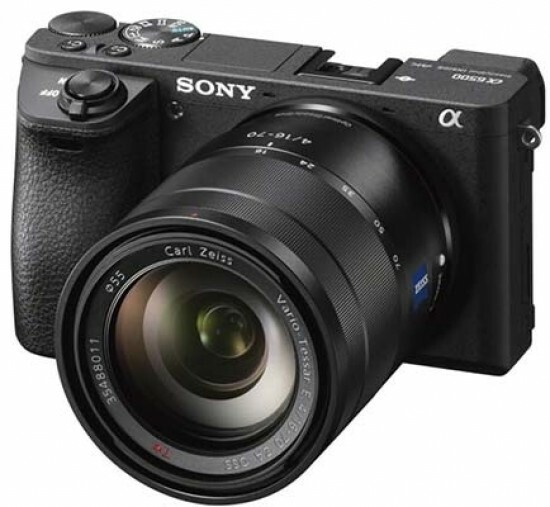 The Sony A6400 is priced at approximately £950 / $900 / €1050. It's also offered as a kit with the E PZ 16-50mm F3.5-5.6 OSS lens priced at approximately £1,000 or in a kit with the E 18-135mm F3.5-5.6 OSS lens priced at approximately £1,300. Externally the new Sony A6400 is extremely similar to the A6300 and A6500 cameras, so much so that you'd be hard-pressed to tell them apart side-by-side. It measures 120.0mm x 66.9mm x 49.9mm and weighs in at 403g with the battery and a memory card fitted, exactly the same as the A6300. 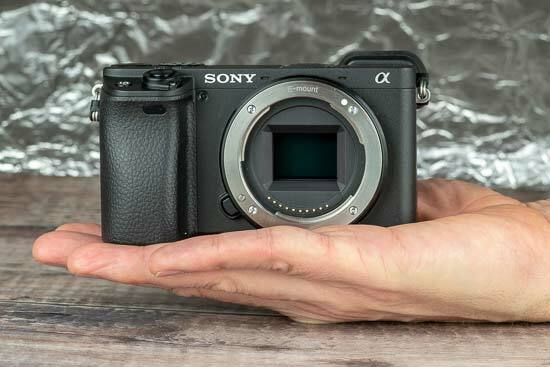 As with that model, the Sony A6400 has a tough magnesium alloy body shell that incorporates full weather sealing for extra peace of mind in inclement conditions. Although not particularly deep (something that was rectified on the A6500), the sculpted hand grip is relatively wide and comfortable to hold on to, which combined with the sizable rear thumb rest makes the A6400 feel secure enough when shooting one-handed. The A6400 inherits the same 2.36 million dot OLED electronic viewfinder from the A6300, which features a 120fps high frame rate setting to help track moving subjects more smoothly with virtually no lag. The same is true of the 3-inch widescreen LCD monitor, which again retains the 922k resolution of the A6300's screen. This time around, though, Sony have implemented a 180-degree flippable design, rather than just 90 degrees of upward rotation and 45 degrees downward as on the A6300. This is more versatile for selfies and vlogging, although if you fit an accessory to the camera's flash hotshoe (like an external mic), you won't actually be able to use the screen in this position. Sony have also implemented touch sensitivity to the screen, just like on the flagship A6500 camera. This makes functions like focus point selection much easier and more intuitive, especially given the lack of a rear AF joystick, and it even works while looking through the electronic viewfinder. Unfortunately, somewhat bizarrely you can't use the touchscreen to navigate the main menu or quick menu settings. 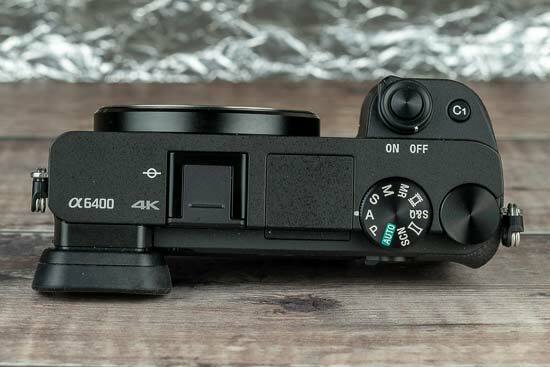 The Sony A6400’s primary controls are virtually identical to those on the A6300. There's the same dual wheel layout with a primary control dial on the top panel and a secondary rear-panel wheel that doubles as the 4-way navigation buttons. It’s a reasonably ergonomic setup, though we’d still prefer an additional control dial positioned near to the shutter release, enabling simultaneous thumb and forefinger settings adjustment. The auto exposure lock button is still located directly alongside the thumb rest within a lever switch that gives the button two functions. Set the switch to AEL and you can meter light and lock exposure independently of the shutter release. But with the switch set to AF/MF, the exposure lock button instead activates manual focus during autofocusing, or switches the focus mode to auto when in manual mode. It’s the further enhanced AF system that really steals the limelight on the new A6400. Where the A6300 featured 425 phase-detection AF points and 169 contrast-detection AF points, the A6400 gets a whopping 425 points of both varieties, phase and contrast, again spread over almost the entirety of the sensor area (84% to be precise). This helps the camera achieve a quoted focusing time of just 0.02 seconds, compared to the 0.05 second time of the A6300 and A6500. Another focusing feature that has been improved is Eye AF. Already impressive on the rest of the Alpha camera range, Sony have simply taken things to the next level on the A6400. Firstly, they've implemented an entirely new algorithm that uses AI-based object recognition to detect and track the subject, improving the accuracy, speed, and performance of the continuous AF system. You simply select the the new Tracking AF mode, position the AF point over the subject that you want to track, half-press the shutter, and the camera will doggedly follow that subject wherever it moves in the frame. It doesn't have to be a person - the A6400 will track virtually any subject that you care to point it at. This also effectively means that you no longer have to activate Eye AF by holding down a custom button (although you still can if you want to). Instead simply half-pressing the shutter button whilst in the Tracking AF mode activates Eye AF automatically if it detects a face/eye, and it seamlessly switches back to non-specific subject tracking if the eye or face can't be detected, then back again when it can. Conversely, you can use the system for easier composition of still subjects too. Simply focus on your subject, hold down the shutter button, and the camera will accurately lock onto your chosen subject while you recompose the frame, even if it's in one of the furthest corners. It's fair to say that Sony's new real-time AF tracking is something of a game-changer for both portrait and action photography - indeed, for any subject that you need to accurately and doggedly track, moving or otherwise. The ease of operation is a real eye-opener (excuse the pun) after years of holding down the Set button, and the sheer speed and adaptability of the system is surprisingly good considering this is just Sony's first leap forward in this area. We can't wait to see the same system implemented on other Sony Alpha cameras, with the flagship Alpha A9 sports camera due to get it next via a firmware upgrade. It’s not just continuous focusing that gets a boost though, as continuous shooting is also enhanced. On paper the A6400 seems to be no faster than the A6300, with both cameras capable of shooting at 11fps using the mechanical shutter with continuous AF/AE metering and almost no perceptible lag on the LCD or EVF. What has been improved is the burst rate when using the electronic shutter, up from a rather pedestrian 3fps on the A6300 to a much more impressive 8fps on the A6400. The A6400's buffer size is a little more disappointing, though, being bigger than the A6300, but smaller than the A6500, despite having the same processor. It can record 99 JPGs and 46 RAW files in a single burst, whereas the A6500 can manage a much more impressive 233 JPGs and 107 RAW files. The Sony A6400 is a very customisable camera. The rear Fn function button displays a quick-access menu of frequently used shooting settings, and you can choose which items appear on this menu. There are also two Custom buttons which can each be assigned a frequently used function for direct access. Even the AF/MF/AEL button can be customised, along with the left, right, down and centre rear panel navigation buttons, as well as the Fn button’s role in playback mode. By default, the Fn button activates the Sony A6400’s Send to Smartphone Wi-Fi function when in playback mode. This works in conjunction with Sony’s PlayMemories Mobile app and lets you transfer a full resolution JPEG image in a nippy three seconds. Of course, you’ll have to connect your smart device first, but NFC pairing makes this a painless process. Even if you don’t have an NFC-enabled smartphone or tablet, Sony lets you scan a QR code displayed on the A6400’s monitor and this automatically enters the SSID password so you don’t need to type it manually. The camera can also be remotely controlled by your smart device, although you’ll need to first enter the A6400’s Setup4 tab on the main menu to activate the Remote Ctrl feature. Just like on the Alpha A6500, a low-power, low-bandwidth Bluetooth 4.1 data connection is now also available on the A6400. This lets you connect your camera to a smart device even when the A6400 is turned off for easier transfer of images. The Bluetooth connection can also be used to sync GPS location data from your smartphone. 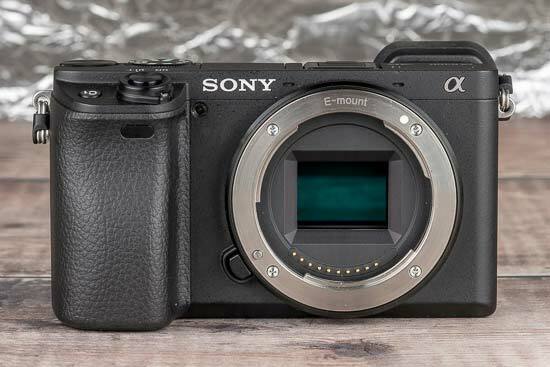 Strangely Sony have decided to make the top panel of the A6400 slightly less customisable by removing the two Memory modes that were found on the A6300's shooting mode dial and replacing them with a single MR mode. This does have the benefit of providing a lot more memory modes, though - 7 in total. There are also the usual auto, semi auto and manual modes, plus a Scene Selection position, Sweep Panorama mode, and a Movie mode that works in conjunction with the video record button located on the right edge of the thumb grip. 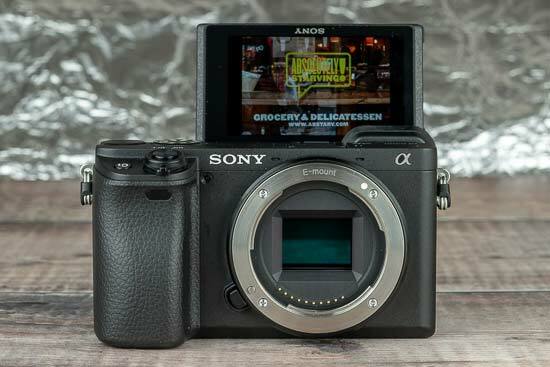 New to the A6400 is the Slow and Quick (S&Q) mode, which as the name suggests gives you easier access to the camera's slow- and quick- motion video options (frame rates from 1fps to 120fps), as selected in the Movie1 tab / S&Q Settings option in the main menu system. The A6400’s video abilities are virtually the same as on the A6300. It can record at Ultra HD 3840 x 2160 resolution at 30fps, and slow motion, high frame rate Full HD 1920 x 1080 sequences at 120fps. The movie-making potential is further enhanced by 100Mb/s high-bit-rate XAVC S data encoding, as well as clean video output over HDMI. The A6400 features Sony’s S-Log 2 and 3 gamma curves which enable it to record greater dynamic range, providing you’re prepared to colour grade the recording in post-production. New to the A6400 is the option of recording in HLG (Hybrid Log Gamma) so that you can shoot HDR-ready footage for playback on your compatible TV directly in-camera. 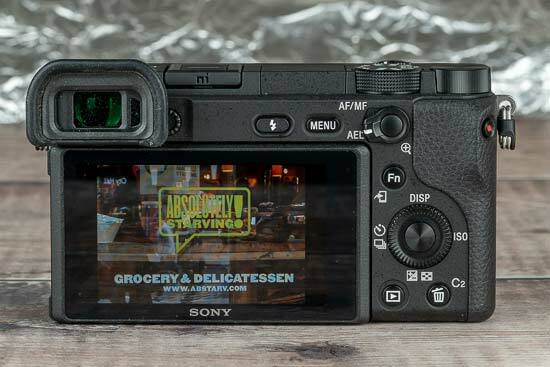 The Sony A6400 uses the latest menu design from the Alpha A7 III camera, rather than the one found on the A6500 and A6300. It has a more logical structure, although as is traditionally the way with Sony's menu, still pretty complicated. There's now a My Menu tab that as the name suggests allows you to construct your own custom menu for easier access to your favourite camera settings. The Sony A6400 will capture an image within two seconds of power-up and keep on shooting for a rated 410 shots per charge, although this drops to 360 shots when using the EVF. The A6400 can also be powered and charged via a USB connection, which is useful if you’re without your charger but can access a computer, although it doesn't use the latest USB-C standard. Finally there’s the battery compartment which, like the other A6000-series cameras, also incorporates the memory card slot. 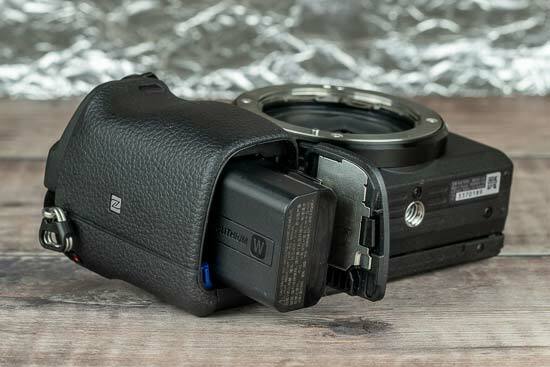 It’s not a major bugbear, as opening the compartment to access the card won’t cause the battery to drop out, and the tripod mount is far enough away to avoid a mounting plate blocking the door. It’s just a pity the card slot’s location nestles right next to the door’s hinge, making it fiddly to insert and eject a memory card.